Explanation: Welcome to the December Solstice, the first day of winter in planet Earth's northern hemisphere and summer in the south. 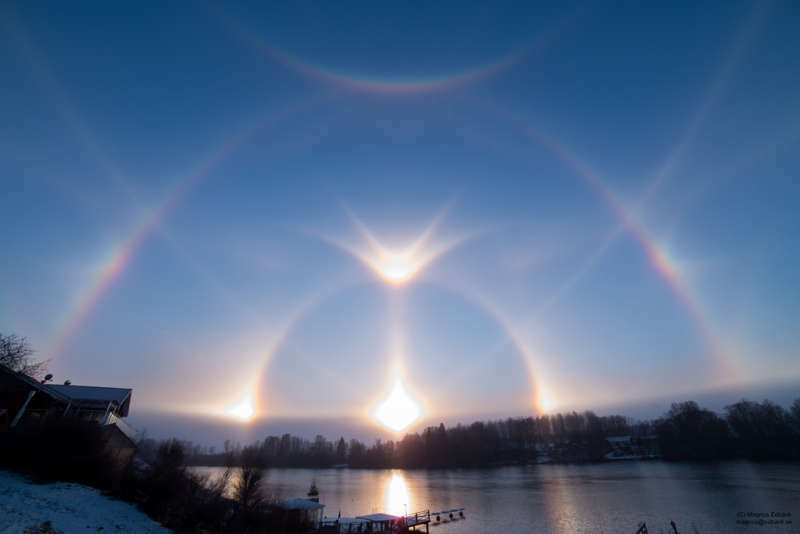 To celebrate, consider this extraordinary display of beautiful solar ice halos! More common than rainbows, simple ice halos can be easy to spot, especially if you can shade your eyes from direct sunlight. Still it's extremely rare to see anything close to the complex of halos present in this astounding scene. Captured at lunchtime on a cold December 14 near Utendal, Sweden the image includes the relatively ordinary 22 degree halo, sundogs (parhelia) and sun pillars. The extensive array of rarer halos has been identified along with previously unknown features. All the patterns are generated as sunlight (or moonlight) is reflected and refracted in flat six-sided water ice crystals in Earth's atmosphere. In this case, likely local contributors to the atmospheric ice crystals are snow making machines operating at at nearby ski center.